Not every jazz festival this summer will be offering audiences a chance to vote in a Johnson-Farage-Putin-Le Pen head-to-head or asking them to show their affiliation for Duran Duran or Wham! 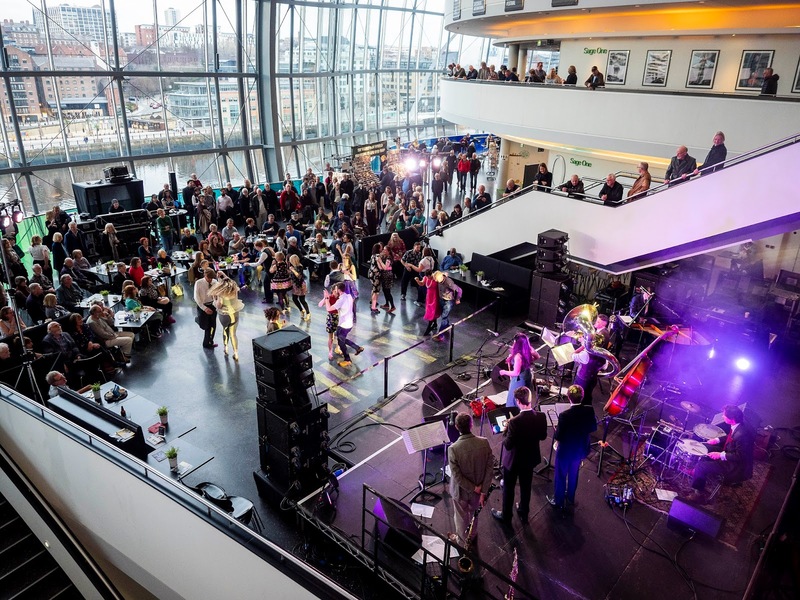 This may well be a relief to LondonJazz News readers but these minor incidences were two of many reminders that emphasised the inclusive nature that Gateshead International Jazz Festival fosters. In its 14th year the event not only brought a decent chunk of jazz history – and quite a helping of its geography – under the one roof at the deeply impressive Sage Gateshead, it drew in impressive numbers of those who might become the music’s devotees in the future. The perpetrators of Friday’s election to see which of the above named political figures should be sent off into space first, Tin Men and the Telephone, had school age smartphone users totally engaged in their Saturday morning games to guess tunes, compose melodies and introduce fairly advanced, not to say outlandish, harmonies. At root the trio, one of three acts visiting under the Going Dutch umbrella, is a very capable continuation of the piano, bass and drums tradition. It’s also, however, great fun. Catering to the other end of the audience age spectrum, Georgie Fame closed a programme that included arguably jazz’s best connected singer, Sheila Jordan, veteran New Orleans disciple Chris Barber, groove merchant Maceo Parker, and the Sun Ra Arkestra with a set that oozed enthusiasm for his jazz heroes while inviting tenor saxophone throw-downs and trombone charges from the Guy Barker Big Band. 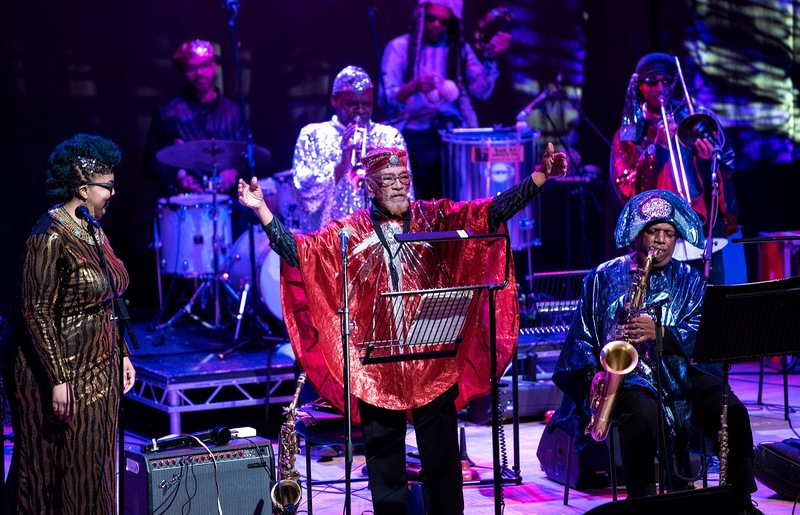 It's a brave piece of programming to open one strand of the festival with four solo pianists, and it had become particularly poignant the day after the death of free-jazz pioneer Cecil Taylor. lt was also interesting to start with the most searchingly experimental, Amsterdam-based Slovenian Kaja Draksler and gradually get more melodic, ending up with Italian Giovanni Guidi, whose initially romantic playing morphed into something more exploratory via a deconstruction of Love Me Tender. In between these two performers, Alexander Hawkins’ percussive and dramatic style, with a thundering wall of almost symphonic sound out of which delicate melodies emerge, called to mind early Abdullah Ibrahim, and Bojan Z brought a much more melodic approach. Balkan dance tunes were never far away as, with a formidable technique, his right hand alternated between a Fender Rhodes and the Steinway while his left hand drove the momentum forward on the piano keyboard. Further piano adventures came courtesy of the concourse sessions which presented, among much else besides, Iceland’s Sunna Gunnlaugs, whose set of mostly original, very persuasive pieces included a splendid, subtly camouflaged take on George Michael’s Wake Me Up Before You Go-Go. Young Scottish pianist Fergus McCreadie’s trio made the most of a short set to highlight fabulous ensemble dynamism and individual flair in music that reflects their homeland’s landscape and traditions while honouring jazz masters from Tyner to Svensson. European jazz featured strongly across the weekend, with Norwegian trumpeter Arve Henriksen closing the festival in a double bill with Belgian duo SCHNTZL and another Going Dutch contribution, five-string violin, guitar and tablas team The Nordanians taking swing into brilliantly executed Indian rhythms. The Estonia 100 session opened with pianist-singer Kadri Voorand, whose theatrical performance was a mixture of words, beatbox, vocalese, electronic loops and songs with practical titles like I Must Stop Eating Chocolate. Her fellow natives Heavy Beauty combined the fierce guitar of Jaak Sooar with the rarely heard sound of a bass saxophone over a heavy rock rhythm in a sound reminiscent of the late lamented Acoustic Ladyland. Saturday’s late night session opened with J Frisco, an all-female group who were recently selected for the Jazz North Introduces scheme. They created very cinematic and atmospheric music from sax, keyboards and guitar before Chris Sharkey and virtuoso drummer Mark Sanders presented a special commission, The Orchid and the Wasp. With Sharkey playing guitar, computer, keyboard and an array of electronic gadgetry while the hyperactive Sanders played a collection of assorted metal and wooden objects as well as his drum kit, this was dense, complex and thoroughly compelling music and the festival is be congratulated for staging it. As well as showcasing Tyneside’s new swing generation, The House of the Black Gardenia, with a very popular late afternoon dance, Sunday also featured the Interchange Dectet, a project put together by bandleader Issie Barratt and comprising ten female musicians and bandleaders playing music from ten different female composers, including several of the band. Some of the compositions were brilliant, as was most of the soloing and although inevitably with a project constructed in this way, some pieces were better than others, at its best the music was sparkling. 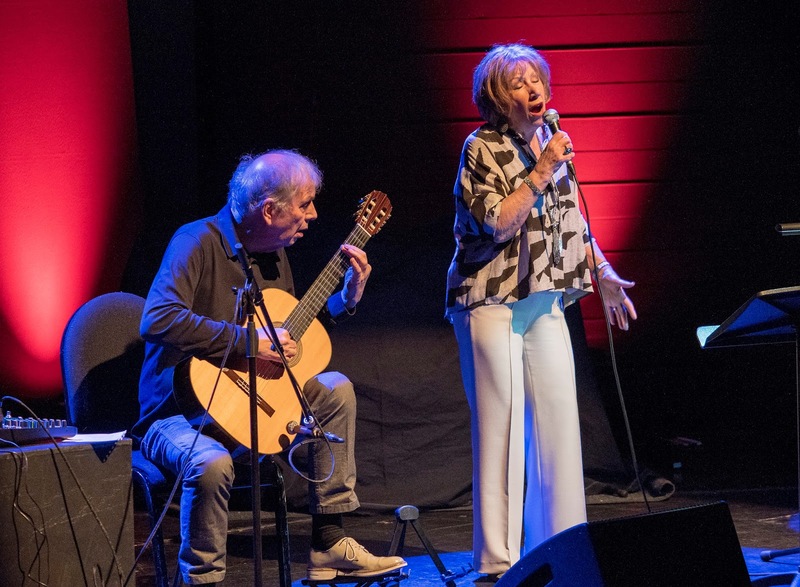 Norma Winstone also sparkled in a concert with the great guitarist-pianist Ralph Towner. Singing mostly her own lyrics, exquisitely tailored to Towner’s compositions in a way that made them sound as if they had been intended as songs all along, she brought meaning to every syllable with her beautiful phrasing and although her voice and Towner’s musicianship are perfect partners, her spontaneous a cappella reading of Nobody’s Heart Belongs to Me while Towner, feeling a draft, fetched his jacket backstage was an unscripted bonus. A word of praise, too, for local promoters Jazz North East whose Best of Jazz from the North and Beyond programme highlighted local talents including guitarist Mark Williams and bassist John Pope and brought a further sense of inclusion through The Ushaw Ensemble’s featuring of Northumbrian pipes in a compelling long form composition by pianist Paul Edis. Not to mention the interesting up-coming Kokoroko ! And the brilliant Ruby Turner!! For a blow by blow report plus photos on over 20 concerts (and counting) go to Bebop Spoken Here blog! We second that! Lance we are among (the first few thousands of) your biggest fans.